After a fulminant victory of Conchita Wurst with “Rise Like A Phoenix”, Austria has woken up! The last victory was 48 years ago, Udo Jürgen’s “Merci Chérie”, and nobody really believed that a winning of the Eurovision Song Contest could even happen again. “Rise Like A Phoenix” was not even in the top of the bets before, but everybody who saw Conchita’s live performance in the Semi Final 2 in Copenhagen knew “that’s it”! With a verve from a guy in woman’s clothes and a moustache became a European super star. Following Conchitas way after the ESC is absolutely crazy, she was invited by the UN, the European parliament, could show fashion from Jean-Paul Gaultier, and appeared at the Grammy Awards in Los Angeles. It’s good to see that she is continuing her music career and released two more singles “Heroes” and “We Are Unstoppable”. After the first discussion which city could be the host city 2015, it became clear that Vienna would be the most suitable host city for the ESC. The cultural activities, hotels and international atmosphere could only be found in Austria’s capital. The Austrian broadcaster has organized a national selection over several shows and qualification rounds with 16 candidates to find the Austrian representative. As a winning country a place in the Grand Final is guaranteed. Of course it’s more than important having a solid host entry. In the final show, the six remaining finalist sang a tribute to Udo Jürgens’ “Merci Chérie”. 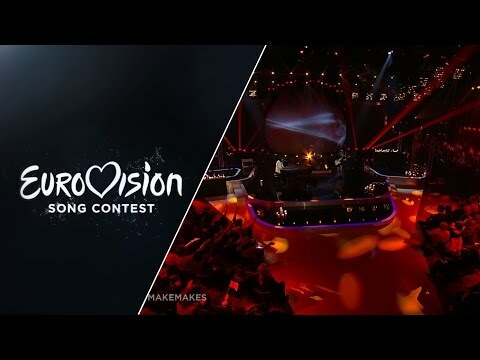 The Makemakes have been not only been the televoter’s favourites, but also received the best critics by the jury especially for the second song “I Am Yours”. 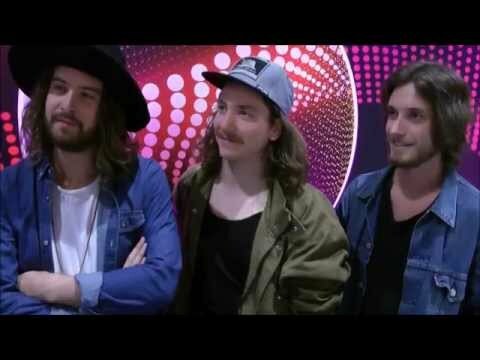 This is on Austrian rock band, founded in 2012, with the following members: Dominic Muhrer (singer), 24 years old from Thalgau, Austria; Florian Meindl, 25 years old and Markus Christ, 25 years old, both from Mondsee, Austria. Florian and Markus have been playing music together since they were 9 years old. The unusual band name origins from the dwarf planet Makemake, which has been praised as deity Makemake in the culture of the Easter Island (south pacific). The band became well known as pregroup of Bon Jovi. The band got even more attention as rumours said that Dominic could be the unlawful son of the Austrian actor Christoph Waltz. The debut single “The Lovercall” reached #6 in the Austrian single charts which is a fine melodic tune, and the follow up single “Million Euro Smile” reached #2, this is another “feel-good” song in the London Westend style. The song “I Am Yours” a wonderful ballad, accompanied by grand piano, a great melody and hook with a very sophisticated approach. Just after the victory of The Makemakes there were reproaches of plagiarism, as the song sounded too similar to “The Scientist” from Coldplay. An official consideration has come the conclusion that there is no evidence for plagiarism. With this entry Austria can really look forward to have great host entry. This is well chosen and shows the musical variety of the Austrians. This is even a top favourite! For Austria it’s the 48th participation in the Eurovision Song Contest. The debut song “Wohin, Kleines Pony” by Bob Martin made the last place in Frankfurt in 1957. This should not be taken as bad omen, as there were quite a lot of successes over the years. 43 times the Grand Final could be reached and at least Austria could get a Top10 position for 22 times. The biggest moments for Austria were of course Udo Jürgens’ entry “Merci Chérie” in 1966. To our all regrets Udo Jürgens passed away in the beginning of this year. He started a very successful career, not only in Austria and Germany, even beyond. He composed more than 1000 songs and released 50 albums and sold more than 105 million albums. Luckily he was able to witness the second Austrian victory “Rise Like A Phoenix” by Conchita Wurst last year. This was a truly revival of the “Sleeping Beauty Austria”. Firstly criticised in its own country, later celebrated as hero - Conchita Wurst has shown what tolerance and freedom really means to the entire world. Conchita also become a kind of icon for the gay and lesbian community and stands for equal rights. Austria has mainly participated on a regular basis, but in recent year they even paused due to unsuccessful entries. But the Austrians came back more enthusiasm and new energy. Nadine Beiler sang “The secret is love”, she has qualified for the grand final in Düsseldorf and made the 18th rank with a stunning performance, the host country Germany awarded this with 12 points! The old twist between Germany and Austria regarding the voting has smoothened. After many years a national final is being been organized by the Austrian broadcaster ORF every year now.